When adding users to a meeting, you do not get the prompt below to send updates only to added or deleted attendees. This may happen even if you didn’t intentionally make changes to the body of the meeting. 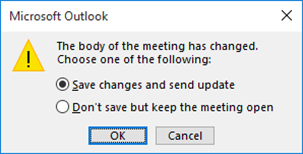 When you add notes to an existing meeting and click Save, you are unable to save the changes without sending an update. This issue is fixed in Monthly Channel Version 1804 (Build 9226.2114) and higher. To get the latest update immediately, open Outlook and choose File > Office Account > Update Options > Update Now.